Bowing to consumer trends, two soft drinks with connections to the past were launched this week for a national, but brief, eight-week run. 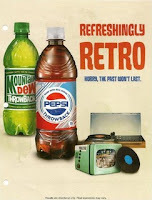 Pepsi Throwback and Mountain Dew Throwback are sweetened with sugar made from cane and beets, unlike their namesakes, which use high-fructose corn syrup. High-fructose corn syrup has been the mainstay for soda pop since the 1970s. The intent, said Pepsi spokeswoman Nicole Bradley, is to remind Baby Boomers what the two drinks tasted like back in the 1960s and 70s. "And for Millennials, they’re something new," Bradley said, generally referring to those born in the 1980s and 1990s. The sugar-sweetened products come as more consumers are returning to sugar and forsaking corn syrup, which is criticized as a contributor to obesity. High fructose corn syrup: How dangerous is it?